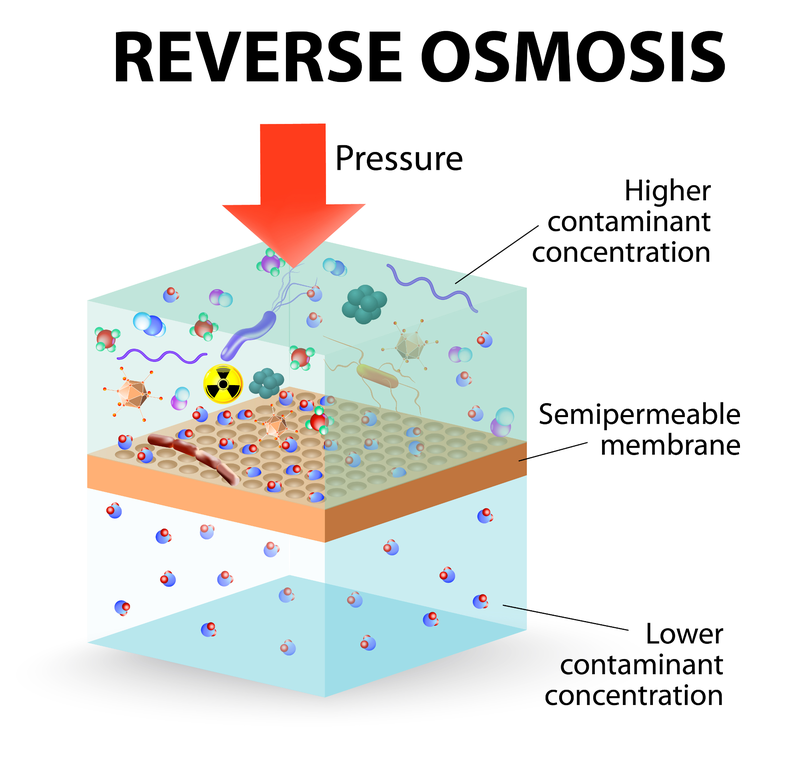 Reverse osmosis (RO) is the process in which contaminating particles (like salt and other minerals) are removed from water. This method is most commonly used to purify drinking water from salty seawater, but can also be used in your home for extra purification of tap water. The water molecules are squeezed through, but the other substances stay behind. Basically, reverse osmosis is a process that gives you extra-clean drinking water! This is an initial stage designed to strain out sediments in the water such as dirt. This step is important because it protects the RO membranes from being damaged by the harsh sediment. This step is designed to remove chlorine and other contaminants from the water as well as help improve the taste and color of the water coming out of your tap. Removing these contaminants is important, since they can also affect the performance and life of the RO membrane. This semipermeable membrane in the RO system is designed to let water through while ridding the water of most contaminants. This final step exists to polish off the process and ensure that you have the best tasting water possible. It removes any remaining bad tastes and odors from the water. Amount of water filtered each day. Number of stages or filters. Home reverse osmosis systems catch any impurities that may make it past the filtration system that your water department uses. Sometimes, even after the filtration process, these impurities that affect taste and odor can get past all the streams, rivers, aquifers, and public filters. The RO system is an extra step in getting these impurities out so that you have great tasting water coming right from your tap. How Do you Know if you Need an RO System? Installing one of these systems in your home is a personal preference. It is the local water department’s job to provide its citizens with clean water, but if you want higher quality drinking water for your family or in your workplace, then an RO system is a great idea. It is an extra step in giving your building high quality drinking water out of the tap without buying gallons of purified drinking water at the store. How Much Maintenance Do RO Systems Need? Reverse Osmosis systems are easy to maintain and upkeep costs are minimal. This schedule is not set is stone and will depend on the system you have, the amount of water usage, and the quality of the water before it gets filtered. Check the guidelines on your system to be sure, but this list gives you a good idea of what to expect. Not all systems run on an electricity charge. Most use water pressure. Even if yours does use an electricity pump, the cost to run it is very low. It is recommended to have your system checked, sanitized, and the filters changed once a year to ensure the best quality of clean water. This is something that can be done by the homeowner or a water treatment professional. How Long Do RO Systems Last? With proper maintenance, a reverse osmosis system can last over 10 years. You can increase its lifespan by changing the membrane and other filters on time and properly cleaning and sanitizing the entire system regularly. Although there is an upfront cost of purchasing a reverse osmosis system, it is a great investment for your home when compared to constantly buying gallons of purified drinking water at the store. With yearly maintenance, an RO system can be a great low-cost option for you. Get that great purified water taste right from your kitchen sink! If you’re interested in getting a reverse osmosis system, check out Advanced Water Solutions’ available residential and commercial RO systems.